One way to keep up your chops on the guitar is to play it in front of the television set during commercial breaks, but with all of the gear in another room, this means you're either left with no sound or playing an acoustic guitar. The solution? The iRig from IK Multimedia. 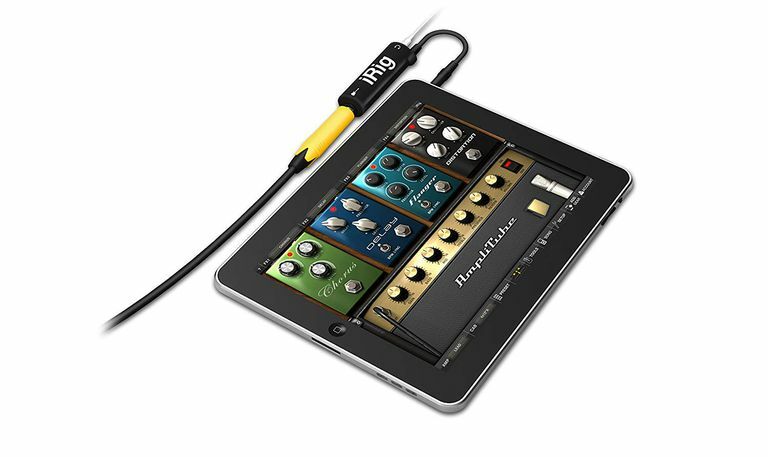 The iRig lets you plug your guitar into your iPad and use it as an amp simulator. You can even output the sound to your headphones, external speakers, a PA system, or even your guitar amp. And going hand-in-hand with iRig is AmpliTube, an app from IK Multimedia that can be downloaded from the app store. AmpliTube provides different effects like delay, noise reduction, and distortion, and you can purchase more effects within the app, including chorus, wah, and phaser. These effects range in price from $2.99 to $4.99, which is quite a savings compared to buying the actual pedals, and the end result turns your iPad into a virtual effects pedal board. But there is more to Amplitube than just an effects package. It includes a guitar tuner, a metronome, and a recorder, with an option for buying an 8-track recorder. And perhaps the best feature is the ability to import songs from your iTunes library, play along with them, and even copy them to a track on the 8-track. Having problems learning a particular riff? You can even slow the song down and take your time with it. There is a lot to like about the iRig, starting with the sound. The adapter comes with a preamp, which provides a very clean sound of good quality to AmpliTube. And while you won't mistake the distortion pedal inside of the app with an actual pedal, it'll compete with most multi-effects packages. For the price, the iRig is tough to beat, and for those who want to bring their effects and amp along with them without lugging a lot of gear everywhere, it's a great deal. The only thing we would change about the iRig itself is the cord. Measuring only six inches, it's simply too short. We'd much rather have the option to have the iPad up on a table and the adapter on the ground. AmpliTube is a different story. The sound it produces is great when you consider you are paying a couple of bucks for an effects pedal that might cost you $100 at the music store. But the interface lacks the same grace. The numerous knobs you'll encounter on your simulated amp and effects packages won't let you properly twist them, and while you can easily add an effect to a slot, you can't drag an effect from one slot to the next. So if you want to add noise reduction to the top of the order, you'll have to set up everything again. But those annoyances are relatively minor considering everything you get. The biggest issue is sound quality, and on that note, the iRig and AmpliTube deliver.